California-based CFI Ron Klutts is an occasional contributor to Airspeed. 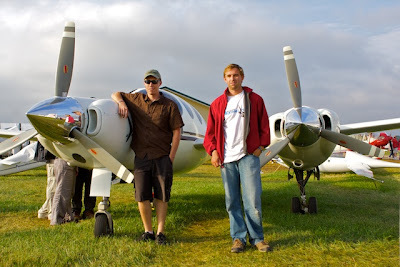 He captured this story at AirVenture Oshkosh 2011. I was admiring the Rutan Boomerang in the Wednesday of Airventure Oshkosh when I spotted two guys who appeared to be working on it. Intrigued, I approached and introduced myself and that’s when I met Tres Clements. He is a manufacturing engineer with Scaled Composites. He lead a team of volunteers who worked over several months to get the Boomerang ready for a tribute to Burt Rutan at Oshkosh. The asymmetric features of the Boomerang are apparent in this view but, as Tres describes the flying qualities, it’s more symmetric than it looks. He discovered during the renovation why certain design choices were made and how they solved aerodynamic problems in an unexpected way. With the CG actually between the two engine pods, use of rudder is mostly not required at high angles of attack. The design cancels out much asymmetry during this phase of flight. Tres recounted how that was one of the benefits in working on this project in getting to know and sit next to Mike Melvill in Burt’s personal airplane. While waiting for the air show to end, I had the opportunity to hear Mike recount many stories of flying to airshows in his own Long-EZ and later perform aerobatics in the show and his take on the other performers and safety was always on his mind. The wealth of experience he has gained and was willing to share with others was apparent. Each engine of the Boomerang has a vertical stabilizer behind it so the propwash adds to the directional control. Adding to the asymmetric look is the lack of a horizontal stabilizer on the right side of the engine boom. Why add weight and more control surfaces if Burt says it’s not needed? Tres estimates that the team spent more than 1,500 hours going through the systems to get the Bomerang airworthy again. That included the panel. Burt used an Apple Macbook as the engine monitoring and data collection system. While the panel still worked when Tres and the team powered it up, the panel needed updating. Ryan Malherbe from General Atomics helped to make and wire the panel. The center is dominated by a Garmin stack consisting of a GMA 350 Audio Panel, a GTN 750 touch screen WAAS GPS NAV/Comm, and a GTX 327. On the left is an iPad 2 running ForeFlight Mobile HD, supplying VFR/IFR charts and all the airport info and taxiway diagrams needed to keep a pilot informed. An AuRACLE 2120 with dual screens at the bottom of the panel monitors engine parameters. With room for five and a pressurized cabin maintaining a 7,000 MSL cabin pressure at FL 200, the Boomerang can travel 1,500 miles with full fuel while carrying a payload of 865 pounds, this is a serious go places airplane. Pictured here are Ryan Malherbe on the left with Tres Clements on the right. Tres says that Burt didn’t want the airplane just sitting in a museum on static display where it might convey the idea that it didn’t fly or was unsafe. He felt the best way to get the message out was for the airplane to fly and demonstrate it’s capabilities by doing what it does best. To fly and be seen. So Tres is doing appearances and presentations. 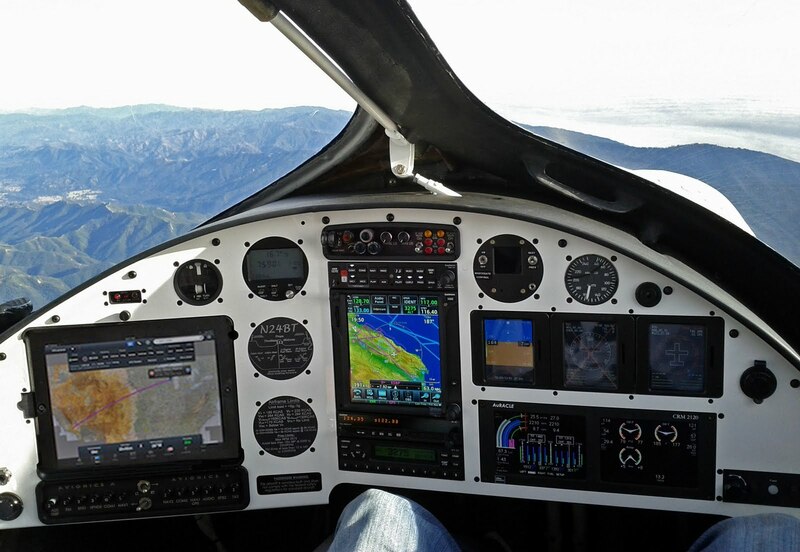 He’ll be at San Luis Obispo (KSBP) for the EAA Chapter 170 meeting at Hangar 49 at 11:30 on Saturday 20 August. Tres will discuss restoring and flying the Boomerang and then the chapter will host an after-meeting barbecue.